I met this guy while walking around a desert wash one night looking for snakes. I was about 2 inches from having a spider friend on my nose when I saw it. Whew! Big and weird looking … the first of these I’ve seen. Entomologists? Any help with the ID? This entry was posted on Wednesday, December 15th, 2010 at 10:27 am	and is filed under Invertebrates. You can follow any responses to this entry through the RSS 2.0 feed. You can leave a response, or trackback from your own site. 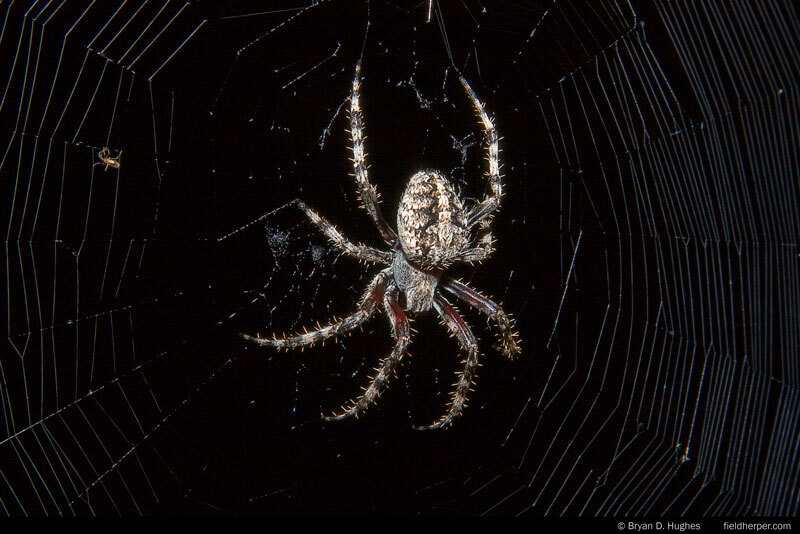 Probably one of the orb weavers (family Aranaeidae) – which one I couldn’t say. Looks like a spotted orbweaver (Neoscona domiciliorum). She’s gorgeous!